In January of this year, Envision IP published a report detailing RIM’s patent portfolio and concluding that “selling its patent portfolio may be difficult due to lack of demand from buyers. However, licensing may be an avenue that could provide RIM recurring revenues for the remaining shelf lives of its patents.” The full report can be read here. In an update to that report, we have identified 153 patents that were assigned to RIM by Nortel, most likely as a result of the $4.5 billion patent purchase by a consortium of companies including Apple, EMC, Ericsson, Microsoft, RIM and Sony. Of these 153 patents acquired from Nortel, 41 appear to be relevant to 3GPP LTE and its underlying and predecessor technologies, such as UMTS, GSM, and EDGE. 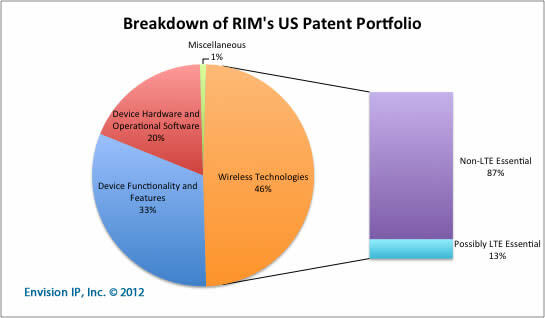 According to our analysis, this gives RIM a total of 269 patents that may be relevant to technologies fundamental to 3GPP LTE.